9.0:1. Hydraulic tappets, automatic choke, GM Varijet carburettor. 4 speed all synchromesh gearbox. The GM Strasbourg 3 speed Automatic gearbox was also offered as a cost option. Front discs, 9.6" diameter, with ATE or Girling twin pot calipers, (1981 cars were usually fitted with sliding calipers). Rear drums, 9.0" diameter. 0-60mph in 11 seconds. Max speed 109mph. 12 Volt negative earth system, 44AH battery. On Wednesday, September 24th, 1975, the new Manta and Ascona B were unveiled in Opel showrooms throughout the UK. The Manta was available as a 1.6 S Deluxe coupe with a 75bhp engine, a 1.6 SR and a 1.6 Berlinetta. The 90bhp 1.9 engine was an option on the SR and Berlinetta at £55 and was said to give a 107mph top speed. The Opel brochure from the time said, "The new Manta has a long, low bonnet line and a built-in front spoiler for better aerodynamics and a generous glass area for improved all round visibility." Brakes for all models were twin pot callipers at the front and drums for the rear. Automatic transmission was available at extra cost instead of the standard 4 speed gearbox. All models shared the same body mouldings and chrome bumpers. There were headrests inside, the SR and Deluxe's being in vinyl. At launch the 1.6 Deluxe cost £2,519.01, £2,716.74 for the SR and £2,881.71 for the Berlinetta. The Manta Berlinetta had a black vinyl roof, velour seats, carpet and door pads, which also had a wood insert. Wheels were 5 1/2Jx13 with 185/70 tyres and a four spoke steering wheel. The SR and Deluxe shared the same interior of vinyl door pads and houndstooth check trimmed seats, and had a two spoke steering wheel. The Deluxe had a basic dash of fuel, temperature and a speedo, while the SR and Berlinetta had the full sports dash. In 1976, all of the range gained an intermittent wiper control, while the Berlinetta gained a tinted windscreen and rear window. Late 1977 saw the range drop to two models. The SR and Berlinetta became one model, the SR Berlinetta ("SRB"). The car had chrome Berlinetta badges on the front wings and a Manta SR decal on the right hand side of the bootlid. The standard engine was the 1.9. The headlining and centre console was colour coded to match the velour interior, colour choices being red, blue, beige or black. A new three spoke steering wheel was also introduced. As an option, an SR chassis kit was available which included uprated rear springs, front and rear shocks and a close ratio steering rack. The 1.6 Deluxe was unchanged until it was deleted from the range at the end of 1977. Broadspeed also offered the same 156bhp turbo conversion as they had offered on the Manta A. Do any of these turbo'ed cars exist today? The 1.9 SR Berlinetta continued into 1978. The vinyl roof was now a factory fitted option. May 1978 saw the 1.9 engine phased out and replaced with the 100bhp 1979cc 2.0 litre unit. To mark the introduction of this engine, Opel produced a special edition Manta and Ascona based on the SR B, known as the Silver 2. Both cars were available in metallic silver paint (hence the name) but came with a few extras, including a factory fitted sunroof and the new 6Jx13 ATS alloy 5 spoke wheels, as part of the Silver 2 package. The interior was blue velour. Only 250 of these Mantas were built at a cost of £4,510. October 1978 saw the coupe gain the ATS wheels as standard with tinted glass all round, the factory sunroof was an option. The range remained unchanged until October 1979. "We made a good car even better. More space, more fun, more style, more value"
That was from the October 1979 Opel catalogue and it marked the introduction of a face lift for the Manta range. On the outside, new black plastic covered bumpers (similar to the Mk1 Astra), with integral indicators, replaced the chrome ones. The interior saw a change with redesigned headrests and front seats which gave more rear legroom. There were new carpets and new velour material for the seats and door pads, which also had the wood insert deleted. A front spoiler was a dealer fitted option. This gave a fresh look to the Manta. 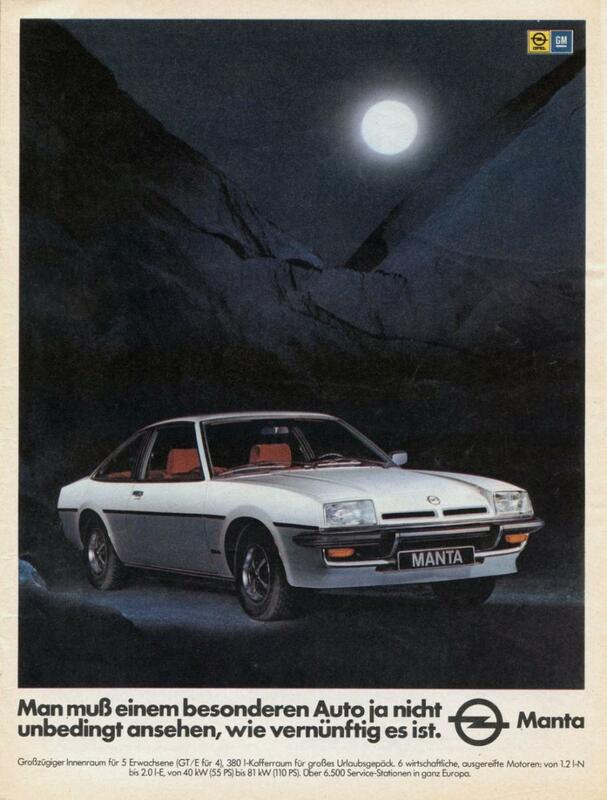 August 1st, 1980 saw another limited edition Manta introduced, the GT/J coupe. 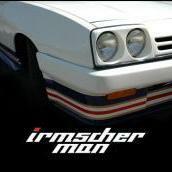 The car was designed to extend the appeal of the Manta to the younger sector of the market. The chrome finish found on the SRB was replaced with a matt black finish, including the window surrounds and door handles. Body side mouldings were also deleted. A special decal kit, comprising of five black stripes from the front wing to the rear 1/4 glass window, added to the sporty look. A GT/J decal on the front panel and boot lid matched the stripes. The front spoiler was standard. The interior was all black with vinyl door pads and seats in special "Beehive" material. The GT/J had 185/70 tyres on 4 spoke 13" rostyles painted in silver and black. Uprated springs, shock absorbers, reinforced anti-roll bars and a high ratio (18.6:1) steering rack completed the package. It was available in three colours unique to the car: Mandarin Red, Brilliant Ochre (yellow) and Pine Green. The cost was £5,339.65. At the same time another special Manta was launched, the Manta S, with a 2.0 litre engine. It came in metallic silver with a factory fitted sunroof and plain glass with a laminated windscreen. Wheels were 5 1/2Jx13 silver rostyles. The interior was blue vinyl door pads with houndstooth cloth trim seats. The dash only had the fuel, temperature and speedometer (as on the old 1.6 Deluxe) with a four spoke steering wheel. Only 200 of these cars were produced, and today it is a rare car indeed. The start of 1981 saw the GT/J added to the Manta range as a standard model and available in all the standard colours. August 1981 saw all the range gain electronic ignition and the SR Berlinetta gained the GT/J's front spoiler. Rear seats were now offered as an option at £73.51. 1982 was the last year of production for the Manta B. The only change on the car was the steel air filter on the engine being replaced with a plastic item. 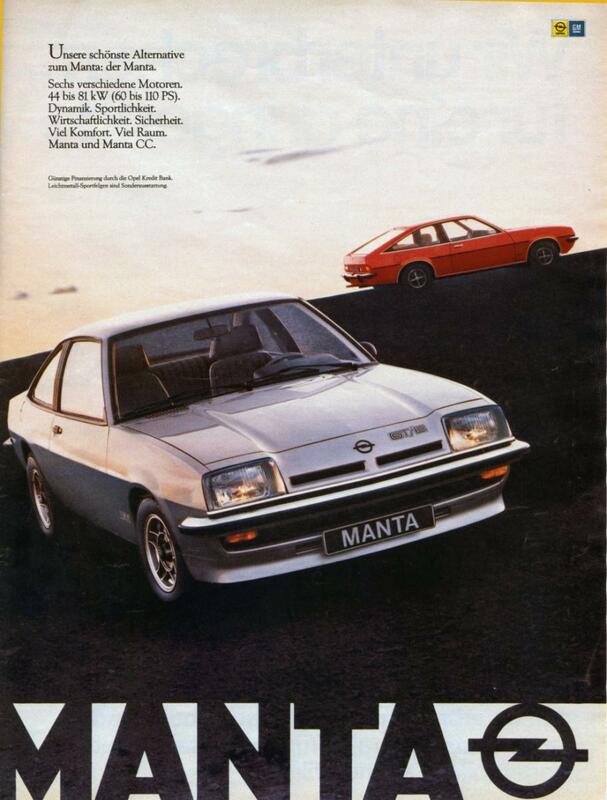 Production ceased in July as Opel began production of the post face-lift Manta B. Today few of the early B series Mantas remain. Even fewer survive in original or standard condition, during the 80's a lot had the later cars spoilers and interior added. There are probably less than 70 in the club, out of 500+ members. How many early Manta B's do you see on the road or at local meets? Prices seems to vary between £3000 for a reasonable example to between £5,500 and £12,000 for a concour's one. The B seems to be more resilient to rust than the later Manta's, although interior trim is starting to become quite scarce. Engine parts are easy to find as the Mk1 Cavalier and early Carltons share the same power unit and gearbox.